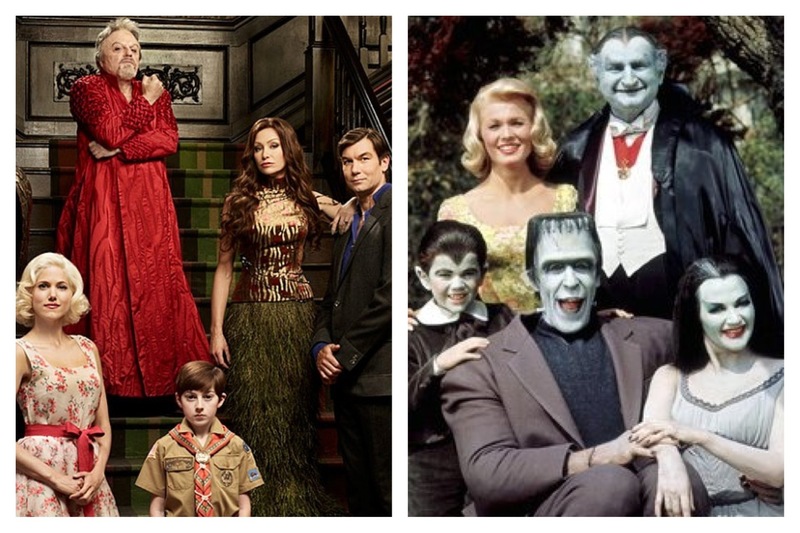 The first family of fright returns to television just less green, more ghoulish and just as quirky (2012’s “Mockingbird Lane” on left and 1964’s “The Munsters” on right). Fans of the Munsters can return to 1313 Mockingbird Lane once again. The classic sitcom which first aired on CBS in the 1960s is getting reboot or a “re-imagining” as Jerry O’ Connell who steps into the shoes of Herman Muster calls it. As of right now it is airing as a Halloween-special for the peacock network. However if the ratings are good it could become a regular series and creator, Bryan Fuller, says he still has hope for it. “The thing that gives me a lot of hope is that first, I think show is wonderful, I think the cast is great. But also that NBC is putting it on the air. They don’t have to do that,” said Fuller. The pilot, bearing the name of the Munsters’ address in the original series, still centers around goofy but loveable Herman Munster, his vampire wife Lily and her blood-sucking dad also known as Count Dracula. Rounding out the Munster clan is, abnormally normal niece, Marilyn and son Eddie who is going through a monstrous transition as he hits puberty. O’ Connell said he thinks fans will find homage in the new and folks who have never met any incarnation of the clan will find it fun too. “While it is an homage to the original, I think it’s going to be very enjoyable to the people who don’t know the original,” said O’Connell. The first with the original series in 1964 and the second in 1987 with the syndicated sitcom, The Munsters Today. The latter ran for three seasons which is one more longer than the original. The Munsters also made a theatrical and several made-for television film appearances. Unlike previous versions this will be a full hour of fright and be much darker in tone compared to the original–from Eddie learning about his werewolf power to Herman’s heart going on the fritz and needing a new one. The pilot will air tonight (Friday, October 26th) at 8/7c on NBC. Chime in: Are you up for seeing the Munsters return with a brand new spin?